AZTI is leading a study on the impact of future ocean conditions on the distribution and abundance of six tuna species. Under marine global warming scenarios, the research foresees increases in tropical species, such as skipjack and yellowfin tuna, concentrating most of human consumption, whilst the rest of the species will move towards the poles. The results of the study, led by the researchers Haritz Arrizabalaga and Maite Erauskin-Extramiana, have been published in the prestigious scientific journal Global Change Biology. 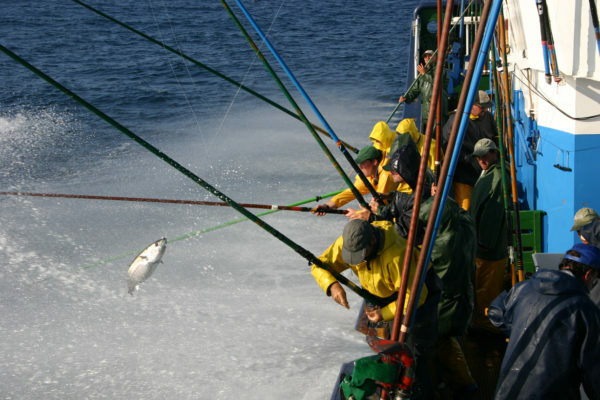 Pasaia, 9th April 2019.- The increase in skipjack and yellowfin tuna in the tropical area, and the movement of the rest of the species (albacore, Atlantic bluefin tuna, bigeye tuna and southern bluefin tuna) towards colder waters are the main conclusions of the research led by AZTI, which has analysed the impact of climate change on the most important tuna species. The study, led by the AZTI researchers Haritz Arrizabalaga and Maite Erauskin-Extramiana, has taken into account the effect of the environmental conditions on the worldwide distribution of tuna species, such as albacore, Atlantic bluefin tuna, southern bluefin tuna, tropical bigeye tuna, skipjack tuna and yellowfin tuna between 1958 and 2004, which has enabled the influence of climate change in the future to be assessed and specific predictions to be made. “During the historical period analysed, the habitat distribution limits of the tuna have moved towards the poles at a rate of 6.5 km per decade in the northern hemisphere and 5.5 km per decade in the southern one. Based on the influence of climate change, even strong changes in tuna distribution and abundance are expected in the future, particularly at the end of the century (2088 – 2099)”, assures Arrizabalaga. More specifically, the study forecasts that temperate tuna species, such as albacore, Atlantic bluefin tuna and southern bluefin tuna, will move poleward. Bigeye tuna will reduce its presence in the tropics and will move to warmer areas. On the other hand, the analysis predicts that the main two canned tuna species (skipjack and yellowfin), will become more abundant in the tropical areas, as well as in most of the fishing areas of coastal countries, or in other words, in the maritime economic exclusive zones which stretches from their coastline to a distance of 200 nautical miles. Tuna predictions offers relatively good news for tuna fishing to continue as an important food source, due to the origin of the main tuna protein consumption in humans comes from skipjack and yellowfin tuna from the tropical area”, according to the expert. The study has enabled an analysis on how the worldwide distribution and abundance of the main tuna species will vary due to climate change and, in this way, quantify the future trends of the tuna populations (how far they will move). “Tuna species are resources of enormous economic importance and a key source of protein for much of the population. As a result of climate change, their habitat distribution is changing and, related to this, the opportunities of different countries to access this source of wealth. This study aims to explain what has happened in the past and predict what will happen in the future, so that countries and fishing fleets can come up with adaptation strategies to the new circumstances”, adds Erauskin-Extramiana. The study forms part of the IMBER-CLIOTOP (Climate Impacts on Oceanic Top Predators) research programme, an international scientific collaboration initiative whose objectives include the prediction of the impact of climate change on big predators, such as tuna. It has been published in the prestigious scientific journal, Global Change Biology, and has been promoted by AZTI, in collaboration with the ICM-CSIC in Barcelona and CSIRO in Australia, with the support of the Basque Government and the Biodiversity Foundation. “Knowing in advance what will happen in the future enables adaptation strategies to the transformations to be drawn up. If a coastal country’s local fleet anticipates the changes in abundance and distribution of the target species, it may adapt its fishing gear or change its target species. It may be able to continue fishing the same species, but investing in larger vessels, capable of going out further in search of these species”, concludes the researcher.